My magic pony, Finn (Far Above Par), has a new owner now, and I am running the gamut of emotions, swooping madly like an out of control roller coaster, both delighted that’s he’s got a great home, and desolate that my special pony is no longer with me. Gone to a new owner! Not mine anymore. 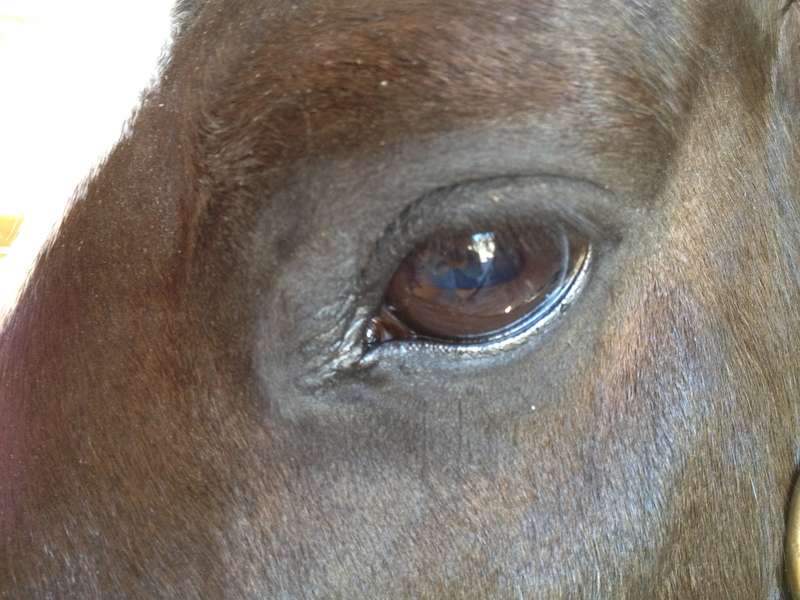 All who have loved and had to sell a horse know that feeling of aching loss. 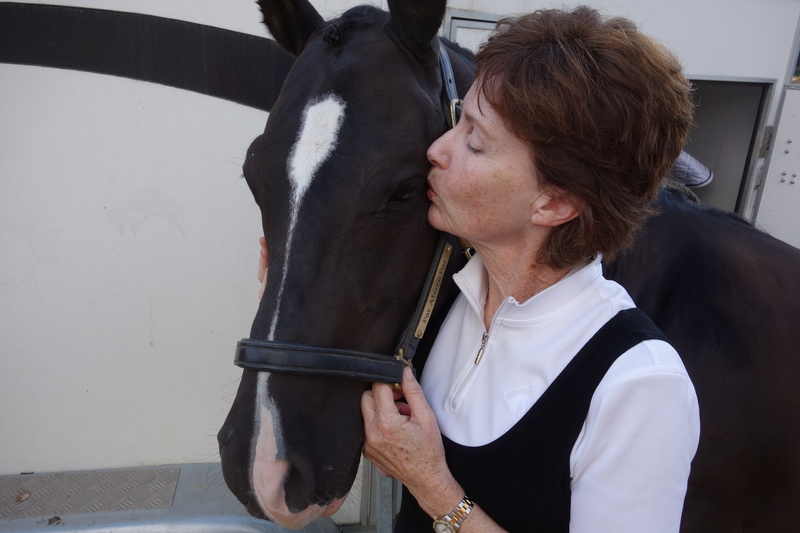 Last moments with Finn before loading him in the trailer for his new home. the grapevine (no advertising yet) very soon produced the perfect owner. I wasn’t quite ready for that – so soon??? – but I couldn’t pass up this perfect match. They were right for each other and looked quite happy together. I learned so much from Finn, and I’m so grateful. And so I let go. And continue to let go of the most wonderful pony. Oh, quirky, yes, he has his little quirks (lots of pony personality), but he made me laugh. 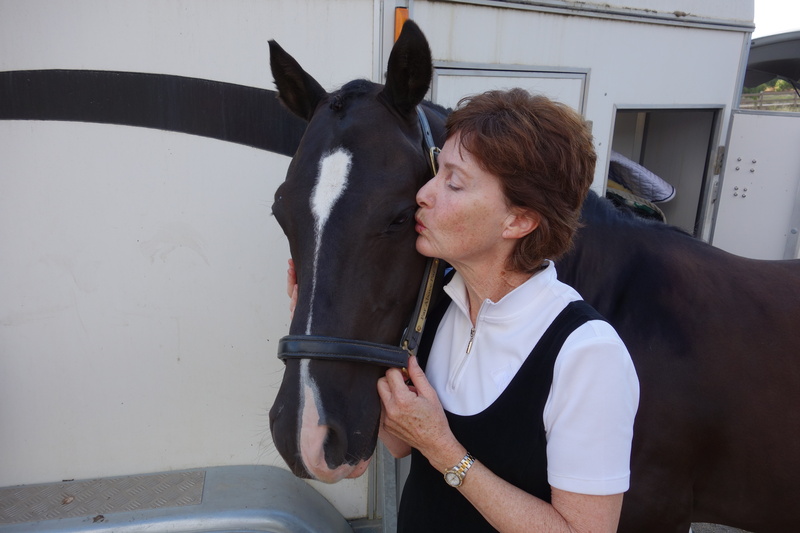 He taught me so much about dressage, and we had fun together, too! 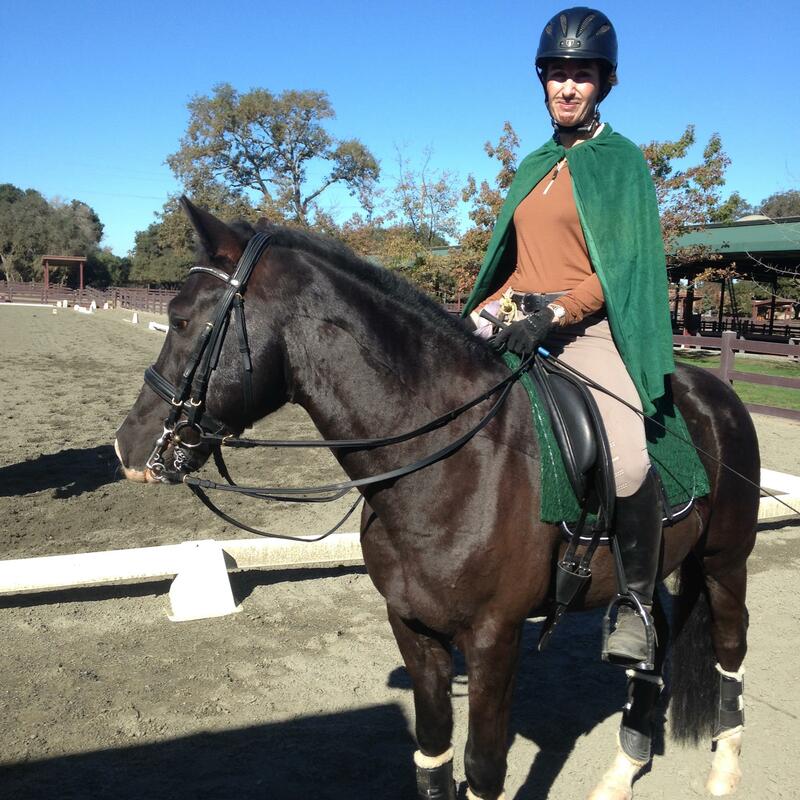 We went on the trail and over jumps, to clinics, dressed up for Halloween, and learned a little piaffe and passage. What adventures we had! And through it all, always safe and sensible, and so beautiful. Truly an exceptional pony, a wonderful New Forest Pony. 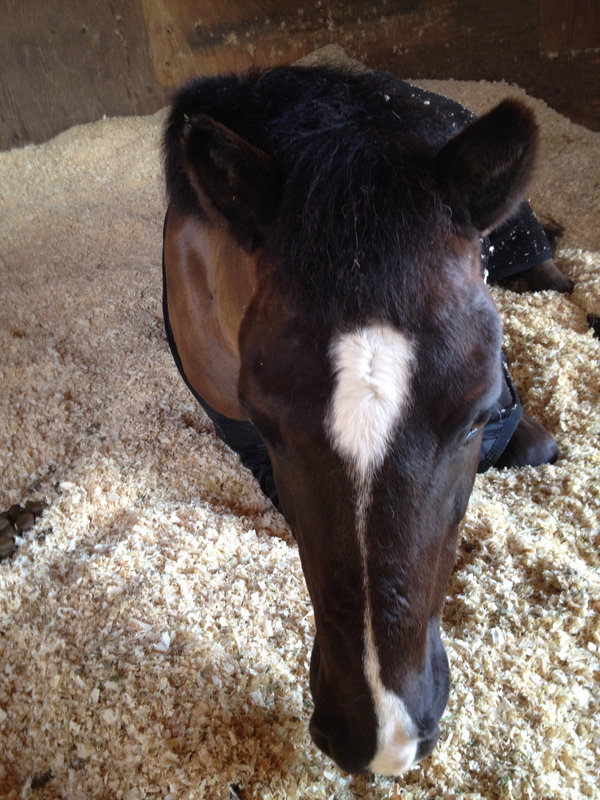 A woman at my barn said, “Did you tell the buyer that magic sparkles fall from his hooves when he is ridden? Because they do…” Yes, they do, they really do. Always a place in my heart, Finn. My pony gave me the perfect present: a great ride today! The rain and consequently crowded arena sometimes makes me a bit grumpy or distracted in my ride. Sometimes it just feels like, “let’s just get this done.” I’m grateful for the covered arena, honestly I am, but it is hard to do concentrated work when people are jumping big fences while you’re trying to do dressage. But today was different. I had a plan and I worked the plan, because no one else was there! Yahoo! A ring to myself, freshly dragged and all ours, such joy! Finn and I took full advantage of our freedom to use the entire arena, and made the ride much more complicated than it has been lately. Circles! Zig-zag laterals! Random transitions without worrying that someone would run us over! Tempi-changes here, there and everywhere! Not all of it perfect, not by a long shot, but we had room to experiment, how perfectly delightful. A big gallop round the arena whenever the energy started flagging, with plenty of praise (and the occasional small treat) kept Finn well motivated. Where is your energy ball? 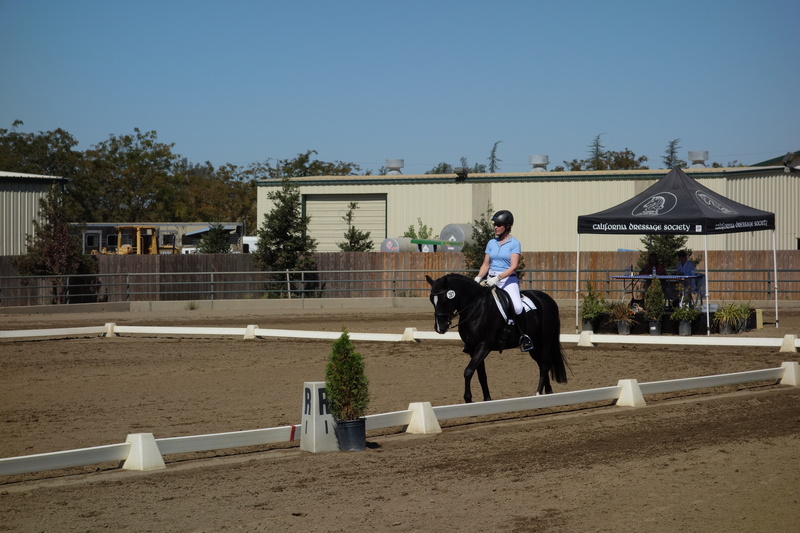 “Keep the energy ball in the middle of the horse!” the clinician reminded me. My horse tends to be more laid back (very safe and non-spooky) and while he is a willing worker, the idea of having a Big Ball of Energy in the Middle of the Horse was a useful one. Rather than trailing hind legs that I continually nag to “keep up, keep up!” I’ve started thinking about having a crackling lightning ball of energy. Think of riding a great, big, bouncing Beach Ball. Fun! Calm horses feel like the energy is behind you, so the rider needs to activate the horse and bring the energy ball forward under the seat. Be careful not to rush the horse forward into too fast a tempo in your desire for energy. A horse that runs along in a quick trot cannot balance himself. 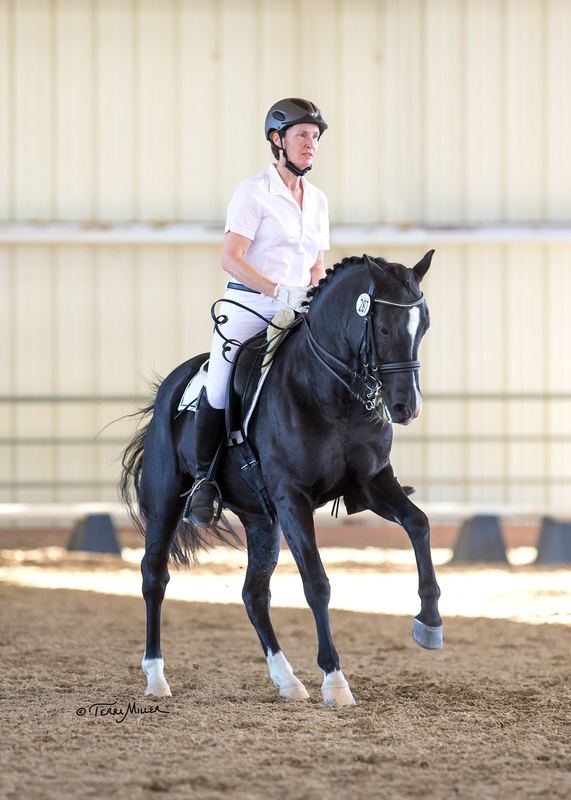 Half halts and frequent changes of gait, plus lateral work, will help activate the hindquarters. An occasional brisk hand gallop forward sometimes helps, too! Here we see Finn’s energy is not yet under my seat. You can see that I am driving with my seat and legs, but he’s not reaching and moving forward into the contact or bending his hocks. Some of you have the opposite problem: energy that gets out in front of you, a feeling like you’re being pulled along, perhaps, or racing along too fast. High energy horses tend to have the energy ball get in front of the rider. In that case, using half halts and the seat brings the energy back into the middle of the horse. Be careful not to pull on the horse, as this will just lead to a tug of war. Horses generally win any pulling contest (they outweigh us, in case you hadn’t noticed). 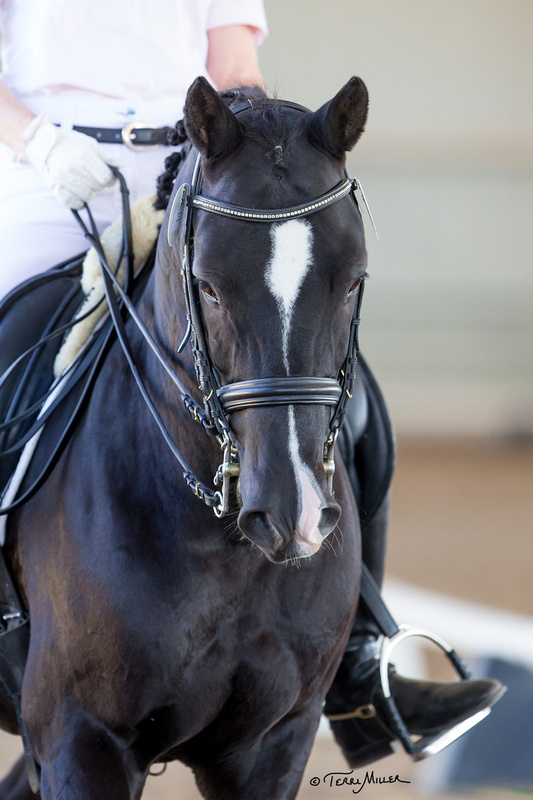 Frequent circles, changes of gait, and some use of lateral movements can help a quick horse slow down and focus. 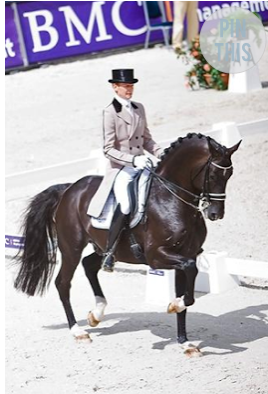 Always we want a sense of energy in the middle of the horse, under our seats, so that we feel the hind legs pushing energy through the back, being softly received into the hand and circled back through to the hind leg again. Ideally, there is a sense that you can go forward or slow down at the slightest touch. It is a very elastic feeling when it works! It begins with getting the energy ball in the right place: in the middle of the horse. Different show (hot day, coats were waived). 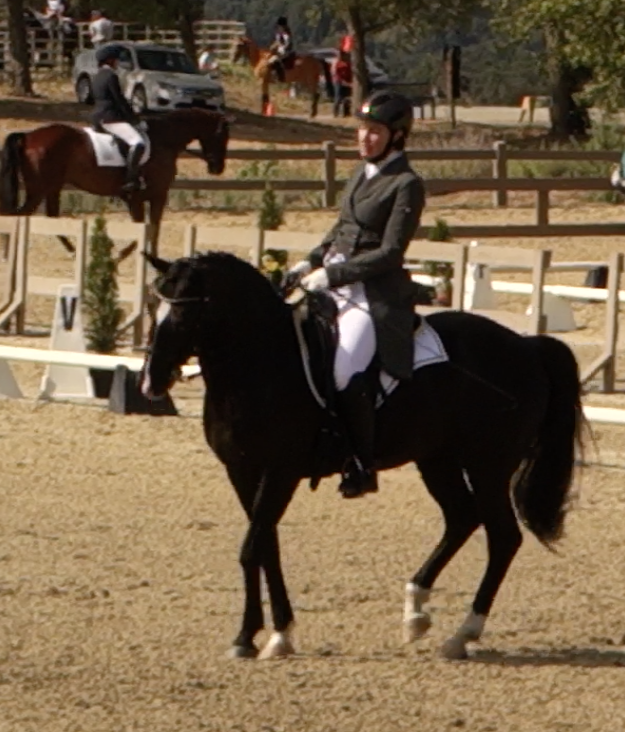 But you can see Finn’s energy ball is balanced under my seat as he begins this working canter pirouette. On Halloween, my instructor promised candy to everyone who came in costume. Wouldn’t you know, nobody – and I mean NOBODY – else did. O.k., a couple of people wore orange shirts. But Finn and I went whole hog. Could it be my acting background? The fact that I have kept a bunch of old costumes at home “just in case”? I love dressing up and pretending to be someone else. It’s always nice to take a break from being yourself. And Finn is happy to go along for the ride. The cloak looked fabulous streaming out behind us, although the clinking bag of coins (treasure “taken from the rich”) quickly became annoying and had to be discarded. I also have to admit that the beard and mustache, dapper while they lasted, melted off my face by the end of my lesson. It was a hot day here in California. Find an occasion, and have some fun with your horse! Robin Hood and Finn: Give me your treasure or Finn will step on your feet. Wow, mom, there are a lot of BIG horses here. 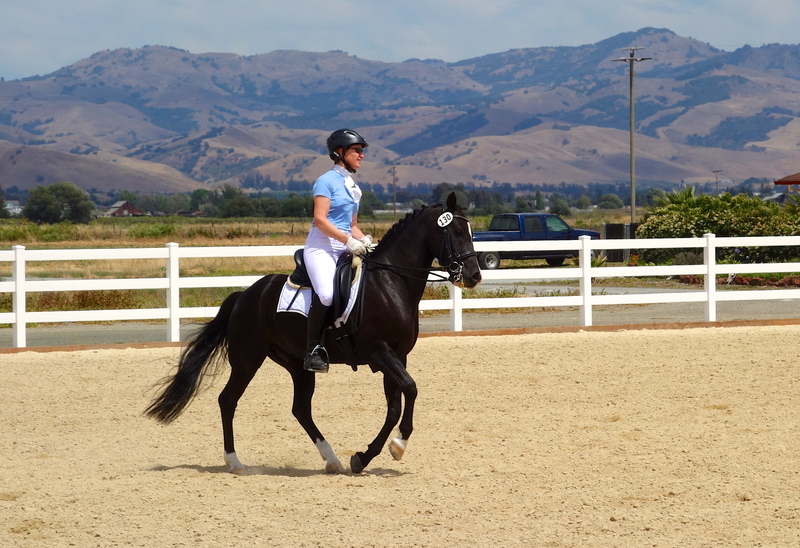 Region 7 Annual Championship Dressage Show! Sounds like fun, huh? If you remember attending a three ring circus – lions in one ring jumping through rings of fire! Dogs on bicycles in the next ring! Jugglers and acrobats in ring three! Tightrope walkers overhead! Your head spinning from the noise, sights, smells – exciting, but kind of overwhelming. O.k., call me a country bumpkin, but that’s how I felt at least for the first day or so. This show ran Five Competition Rings simultaneously for four days, as well as multiple warmup rings, a lunging ring, with over three hundred horses attending the show, people whizzing about in golf carts and on bicycles, multiple fancy tents set up with ribbons galore, champagne, and even a crystal chandelier…you get the picture. All Finn was wanted a cool drink with a little umbrella in it, a chaise longue, and someone to fan him while stroking his brow murmering, “poor thing, poor thing.” Or maybe this was MY fantasy? Same difference. Neither of us wanted to perform under the broiling sun. Nevertheless, we soldiered on. Maybe the heat separates the Men from the Boys, or in this case, the Women from the Girls, or perhaps the Super Serious Intense Athletes from, well, the rest of us. Those who would much rather show when the weather is more pleasant. Count me in with them. But I digress. How was the show? I saw some beautiful rides and some amazing horses. Wow. Some not so beautiful rides. 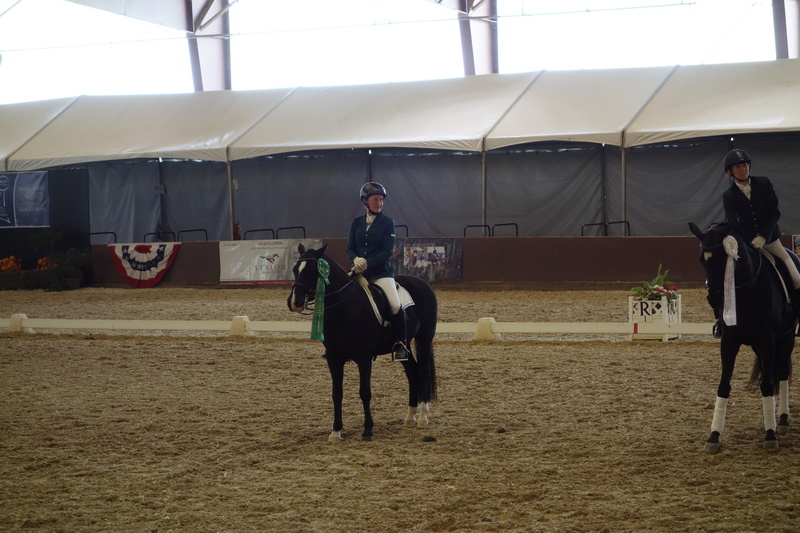 Finn and I had a couple of good rides but interestingly, the judges were quite spread out in their opinions (six points difference from the judge at C and E pretty much each time we rode, big differences in scores, a bit confusing for me as a rider). Why? Well, of course there is perspective, and there are also preferences, and there is some subjectivity, too. Sometimes it works for you, sometimes it works against you. Our last test of the show we both just ran out of steam and got a deservedly low score. Lesson learned: if you think it is too hot and you and your horse are worn out and have already put in a test that morning, you probably should just scratch the second test at noon. What kind of crazy person would stay to ride in 100 degree heat? Duh. Would someone PLEASE bring us some cool drinks? And iced towels? All in all, it was an interesting learning experience, but I think not something we’ll do again next year. Finn standing calmly at the Awards Ceremony, amidst all the Big, fidgeting horses. Bless his pony heart. There are plenty of other more fun goals to shoot for. Prix St Georges, anyone? Fix up our Freestyle? You betcha! More trail rides before El Nino hits California? YES! A little more fun and a little less drivenness? An enthusiastic YES from Finn! Many cookies shall be yours, my good pony. I am not one to give many treats by hand. Having owned a fair number of ponies along the way, I’m familiar with their swift and compelling obsession with the hand in the pocket: GIVE IT TO ME NOW, NOW, NOW!!! Or I take the hand, too. And yet, I’ve noted that the use of an occasional treat really sweetens Finn’s demeanor and motivates him to work harder. It reinforces training. Finn would probably make an excellent circus pony. Cute, highly trainable, very motivated by treats. So I keep that in mind as we do our dressage training. The occasional carrot or cookie reinforcement is not a bad thing. When Finn first came to me, he was perfect in almost every respect except that he expected a cookie to stand at the mounting block. This is common, many people train their horses this way. 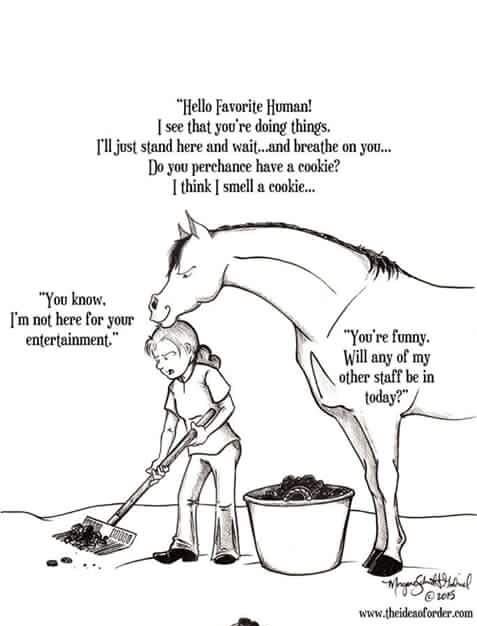 However, I believe a horse needs to just stand for mounting with no treat, because what if I don’t have one some day? I might be on the trail and have to get off and on for some reason, or be at a show and not have anything in my pocket. I don’t want to run around looking for a treat at that moment. So we began mounting block training. The first four days, Finn threw a fit at the mounting block each day. WHAT? NO TREAT??? He fidgeted and wouldn’t stand still. I mounted rapidly (this is the dangerous moment), and then he would throw himself backwards and have a temper tantrum. “Where is my TREAT??? I want my mommy!!! You’re not a nice mommy, you’re not doing things the right way!” He even reared a little (naughty pony). The tantrum only lasted 20 seconds each day, but it was impressive and dramatic. Then we would be on our way and everything was fine. I’ll say this for Finn: he can let it go and move on. For four days, Finn threw bigger and bigger tantrums, trying to intimidate me into his way of thinking, but I am made of sterner stuff. I would win the battle of the mounting block! On the fifth day, he stood quietly (if a bit sullenly). He realized it was a new day, a new deal, and he wasn’t going to win this one. I praised him copiously but did NOT give him a treat. Nowadays Finn often get treats from me for good work, and sometimes just for being cute, but never anywhere around the mounting block. If someone else rides him and gives him a mounting block treat, it resurrects that behavior (oh no!) although I’m able to pretty quickly re-establish the right behavior again. He knows what I expect at the block and he’s perfect now. Treats given judiciously and with the right timing are a useful training tool, and we enjoy giving them, so why not? Extra effort, or some new training, should be rewarded with verbal praise, a soft pat, and sometimes a treat. Studies have shown that intermittent reinforcement is more effective than rewarding on a schedule, so it’s best not to give a treat EVERY time your horse does something well. Vary your rewards, but do reward your horse. She appreciates it! And sometimes it just feels good to give your horse a carrot, because it makes him SO happy. 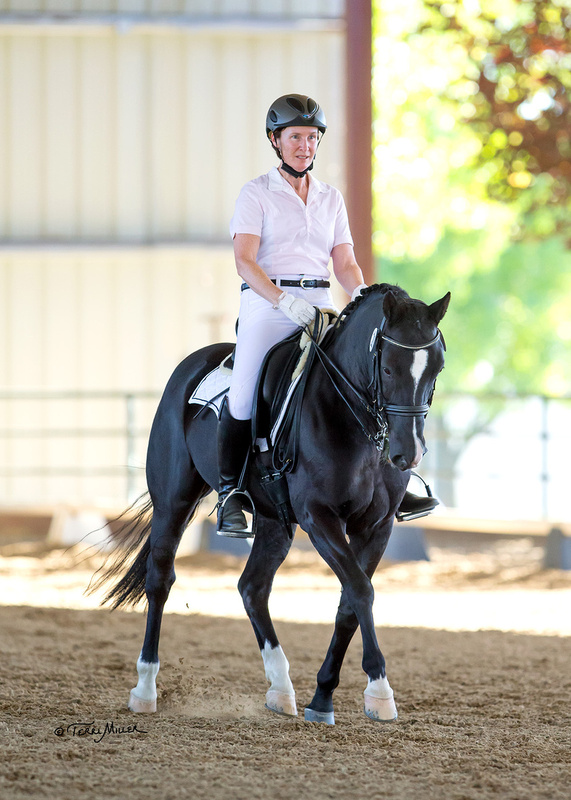 Of course, if your horse is insulin resistant, give low sugar treats or stick to pats and verbal praise.